Mike Mignola and Richard Corben team up for the sixth time* for this touching and gruesome tale in which Hellboy takes his despondent pal Roger to South Caroline so they can investigate a haunted mansion. Roger has every reason to be down—he’s a “15th century homunculus,” which apparently means he’s a big, rock-like naked guy with gray skin, an iron cap riveted into the center of his chest and some kind of block and chain chastity device covering his crotch. Roger appears to be and acts more or less a man, but he’s still figuring out what it means to be human. 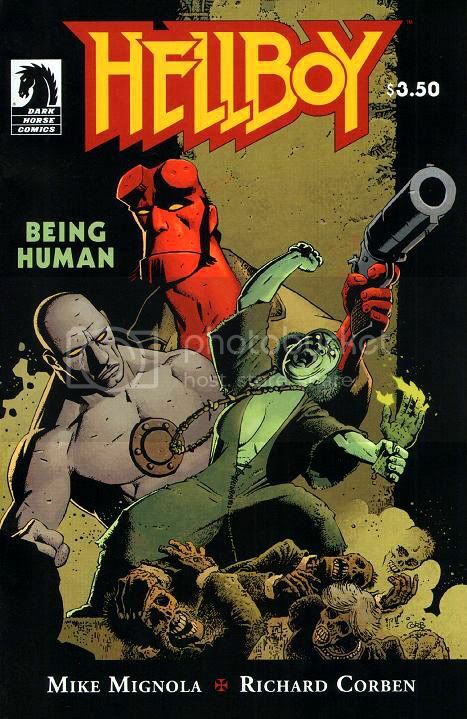 Hellboy, the human/demon hybrid with a blue collar attitude towards his job of punching folkloric creatures and Lovecraftian space demons, is the perfect guy to give Roger advice on the topic. The haunting involves animated corpses, a witch and long-held family grudges. Mignola balances the weirdness with an affecting portrayal of a confused Roger, who despite his strange origins possesses an innate decency. He desperately wants to do the right thing, if only he knew what that was. As with "Makoma" and "The Crooked Man," Richard Corben proves to be an ideal match for this kind of moody, dark Hellboy story. He’s not the kind of artist who gets hung up on classical anatomy, but he gives his stumpy characters solidity and presence with his unique method of modeling, a kind of mottling or stippling. Whether it’s Roger’s stonelike skin or the mossy corpses and fungi-covered walls of the mansion, Corben is your go-to guy for sickening textures and miasmic atmospheres. Looking at these pages you can almost smell the damp plant-life and epic decay surrounding Hellboy and Roger. Corben's characters wear facial expressions that are frequently borderline comedic, but then he treats you to a stark panel where someone’s had a hole blown through her chest with gore draining out in a big red gusher. Yeah, unique. There’s not another Corben out there and we should treasure the one we have. While I certainly don’t begrudge Mignola his forays into comedy, these uneasy tales of generational crimes and identity questions are the ones that stick with me long after I’ve closed the comic. It’s nice to revisit the tragic Roger and find Mignola amplifying those themes by exploring his character. Knowing Roger’s fate makes this story all the more poignant. "Being Human" is touching, grotesque and altogether memorable, the kind of stand-alone issue that's as rich if not richer than most multi-parters. It makes me long for the days when creators knew how to craft a story in one perfect, self-contained unit. *Correction. Someone pointed out this isn't the third collaboration between Mignola and Corben. With the economy being the way it is and all, I've had to let go a lot of my staff. The fact checkers were the first to get pink-slipped. And while corrections are welcome and appreciated, for future reference only I am allowed to be snotty in this blog. Now all is cool again and that is very, very appreciated. Thank you!